If youth knows no pain was the mantra Lykke Li once lived by, that's certainly not the case on her latest effort, I Never Learn. 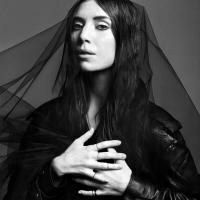 Lykke Li has explained that she conceived of her new album I Never Learn as the final installment in a trilogy of works. Going along with that interpretation, Li's catalog to date can be taken as a coming-of-age story chronicling how the Swedish could-be pop star has changed and developed both as a person and as an artist since she made a splash with her precocious 2008 debut Youth Novels. Along those lines, I Never Learn can feel like the endpoint Li was aiming for as she nears the end of her 20s, as she's come up with a more mature album in theme and sound when compared to the playfulness and whimsy that made Youth Novels and 2011's Wounded Rhymes stand out. Taking her at her word, Li's said how the latest effort represents her voice as a musician more fully and accurately than before, as someone who sees herself as a singer-songwriter and not a pop artist. That's not to say that I Never Learn is about coming to pat conclusions or easy resolutions, rather just the opposite: For Li, in this time and place, her provisional ending is a sad one. While she has the chops and charisma to be a pop star, Li doesn't choose to go take the path she's been set up for on I Never Learn, creating music that she's admitted can be a bummer. Made in the wake of a bad break-up, I Never Learn might as well be a portrait of an artist in a midlife crisis, an album that feels more like the product of someone who's still working through her issues rather than wrapping up a chapter of her life – the album's very title suggests that she's still in the process of being burned by experience and figuring things out. So if youth knows no pain, to riff off the title of Wounded Rhymes' lead track, was once the mantra Li's eclectic pop lived by, that's certainly no longer the case with the lushly downbeat pieces on I Never Learn. Thematically as well as musically speaking, I Never Learn is an exploration of melancholy in all its shapes and forms, from maudlin melodrama to icy blues. Setting the mood to follow, the title track opens I Never Learn by luxuriating in Li's gloom-and-doom moods, her echoing vocals and shimmery acoustic strum capturing her solitude, with a touch of swooning strings to dress up her innermost pain with a sense of drama. First single "No Rest for the Wicked" picks up that thread and doesn't just run with it, but stretches it further, its spare, minor piano notes and Li's languid voice building to a forlorn flourish when she hits the chorus. Most devastating of all, though, is the minimalism of "Love Me Like I'm Not Made of Stone", which draws you in because Li's sharing such an intimate moment you can't help but eavesdrop, as she goes almost a cappella to groan out the title phrase as if she were channeling some long-lost blues lyric. Yet even if Li sounds like she's trapped in her own headspace through much of I Never Learn, so much so that her music isn't really about reaching out for commiseration, her pop-minded instincts are present enough to keep her songs from being so inwardly focused and self-pitying that they collapse in on themselves. While Li is completely earnest when she croons, "There's no song for the choir / There's no hope for the weary," on "No Rest for the Wicked", her own music bears out that that's not exactly the case, since I Never Learn is a whole album of sad songs that offer just enough hope for the weary by opening up the cathartic process Li's going through. Even if the overcast tone that pervades I Never Lean doesn't really ever lift, Li still creates moments that make you willing to keep her company in her misery. That's most apparent on "Heart of Steel", as Li's rending, pleading vocals are underlined and amplified by a choir echoing the title words, giving a glimpse of the girl-group-like tones of Wounded Rhymes' catchiest numbers. And when "Gunshot" hits with its rat-a-tat drums and Li's stark vocal melodies, the album's hardest hitting pop number proves she can have it both ways, expressing her inconsolable longing with the catchier, more accessible stylings she was once known for. Without such instances, so many shades of gray can run together, no matter how exquisitely Li renders them. Even though Li's despondent tone may be pitch perfect, it's still mostly one pitch that does get a bit monotonous at points on I Never Learn, due to the album's sequencing and all the nine tracks coming in at roughly the same length. Coming on the heels of the opening tracks, the washed-out "Just Like a Dream" feels more dreary than dreamy considering where it's placed, simmering with hazy melodies that never quite reach a boil. Compounding that feeling is the mid-album mid-tempo ballad "Silverline", which feels all the more flat because it extends a lull at the point when a change in pace and mood would help push things forward. Maybe an older, wiser, more wounded Li can't go back to the giddy exuberance of her earlier work, but it wouldn't have hurt if Li picked some more spots to flex her pop muscle memory. Indeed, the brief bursts of contrast that mainly appear later in the album come off all the more dynamic and dramatic, making you wish there would've been a broader range of textures, tempos, and tones on I Never Learn. In turn, shifts in mood and cadence feel even bigger and more thrilling when they happen on I Never Learn, as Li's intuitive pop sensibility beams all the brighter because the cloud cover can be so heavy. Case in point is how the album hits its peak with the second-half pairing of the achingly spare "Love Me Like I'm Not Made of Stone" and "Never Gonna Love Again", with pop gestures bold enough it wouldn't be hard imagining Rihanna remaking it: placed next to each other, the introspection of "Stone" and the dramatics of "Never Gonna Love Again" draw out something extra from each other just in their juxtaposition. So when Li concludes on the latter, "And I'm never gonna love again," as sweeping piano figures crash against swooning synths to create a grander sense of scale and spectacle, the line and its delivery are all the more compelling because Li hits a note here that's distinct from what surrounds it. It's that sense of flair on "Never Gonna Love Again", that intuitive knack that can turn the most private of internal monologues into arena-sized torch songs, that suggests I Never Learn is actually where Li's story get more and more interesting, rather than simply being the end of a trilogy. If nothing else, Li hints that she's turning the corner, at least in sentiment, as she closes I Never Learn on an open-ended note with "Sleeping Alone". Through the go-with-the flow tone of "Sleeping Alone", Li's not just bemoaning the loss of something, but she's finding herself again by being on her own, as if understanding that the unhappy ending here is also the start of something else. As Li puts it, with the long view and the big picture in mind, "Some day, somehow / Somewhere down the line / If you save your heart for mine / We'll meet again." Despite the finality of what's supposed to be the third installment of a three-part series, I Never Learn promises more in the future as Lykke Li keeps moving along her own singular path, personally and artistically.